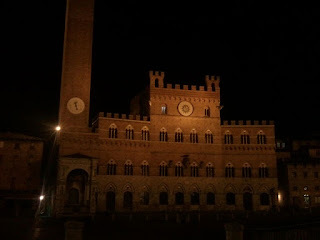 Jan 9, 2013 – We checked out of our hotel in Siena early so we could drive 2 hours through the Tuscan countryside to Bolgheri by the sea. Linda, our tour director, considered asking our bus driver to take the longer route via freeway to avoid the chance of people getting car sick again on the very twisting roads through the hills, but in the end everyone voted that we take the faster and more winding route past the ancient hilltop town of Volterra. The drive ended up not being as bad as we feared and we arrived at Tenuta San Guido, the home of the very famous Super-Tuscan wine, Sassicaia, a little earlier than our appointment – which made me feel quite relieved. It had taken months to schedule our trade delegation appointment here, and I was fearful of any delays that could cause it to be canceled. However, we were greeted by the friendly, smart and energetic, Elena, who made us feel very welcome and many people in our group said this winery was the highlight of the trip. Elena started with an overview of the vineyards and explained that though Bolgheri was a DOC on its own, they also had their very own Bolgheri Sassicaia that was granted in 1994. All together Tenuta San Guido has 77 hectares of vines, with the first cabernet sauvignon being planted in 1944; the first vintage for the market was not released until 1968. They are located 10 kilometers from the sea, with the vineyards ranging from 36 to 60 meters above sea level. The soil is a combination of stones, clay, and sand. The term “Sassi” means “wines from rocky soil.” Most of the vineyards are on a north/south orientation in order to avoid the salty ocean breezes. The soil is rather rich, so they have had to use wide spacing and VSP cordon trellis in order to achieve the “power and elegance” they want in their wines. The average age of the vineyards is 30 years. After reviewing the vineyards, Elena led us into the first year barrel room where we were all overcome with the sweet smell of aging Sassicaia in French oak barrels. Though we were not able to see the fermentation tanks, Elena explained that the grapes are first sorted before being transferred into stainless steel tanks where they undergo fermentation using natural yeast for around 15 days at an average temperature of 31C. Pump overs and delestage are used, and ML occurs in tank. Next the wine is moved to 225 liter French oak barrels where it ages for 2 years in 20 to 25% new oak with medium toast. The wine is racked 5 to 6 times with no topping. The cellar has excellent humidity control so topping is not necessary. The wine is not filtered, and nitrogen gas is used to protect the wine when being transferred. After the blend is assembled, it marries for one month in tank and 3 months in bottle before release. In general, Sassicaia should be saved for 10 years before drinking. Elena explained that Jacomo, their winemaker had just retired, so now a team of people under the leadership of Niccolo, the present owner, makes the wine. Since the majority of Sassicaia wine is allocated, “soft marketing” was the term Elena used to describe their promotion methods. They do submit the wine to very high end auctions, and make sure to pour at key events such as Vin Italy. They work very closely with selected distributors within Italy and around the world. Currently they export 45 to 50% of their wine with the USA being the largest market. We were honored to be able to taste 4 wines from this estate, with the first being the 2009 Barrua from their sister estate in Sardinia. Though I generally do not care much for the rough taste of carignan, this had to be the best example I’ve ever tasted. It was 85% carignan and 15% merlot and cab, and had a savory, dark berry and herb nose and palate, with fresh acidity and a long finish. Next we tried the 2010 Le Difese, 70% cab and 30% sangiovese, and named after the wild boar tooth. It was a light and elegant drinking red which Elena said pairs quite well with the local fish in red tomato sauce. Third was the 2010 Guidalberto, 60% cab and 40% merlot aged 15 months in French oak with a touch of American oak as well. Some people refer to this wine as a “Baby Sassicaia,” and I must admit it still needs some time to open. It had a beautiful nose, but was tight with dark berry, earth and a long finish. The last wine was the 2009 Sassicaia, which exploded on the palate with rich plum, berry, and spices of nutmeg and pepper. It is 85% cab and 15% cab franc with good balance, softer tannins and medium-high acidity. I was surprised at how approachable it tasted, since other young Sassicaia’s I have tasted are often rather tight with strong herbal notes. This was full of fresh fruit and spice, and I wondered about its aging potential. Most probably because of its fruit-intensity, this wine was an immediate hit with everyone in the room. After the tasting, Elena made arrangements for us to visit the Tenuta San Guido wine shop across the road from the winery. Here we purchased olive oil from the estate, and many people picked up a bottle of the Sardinian wine, but we didn’t buy the Sassicaia because we realized we could purchase it for the same price in San Francisco ($155) and not have to risk breaking it in our luggage on the way home. For most people in our group, visiting this estate was a dream come true. The wines were spectacular, and everyone was charmed by Elena. Sassicaia is definitely a “bucket list” wine for most wine lovers, and this visit is one that all will remember fondly for the rest of their lives. Jan. 8, 2013 – It only took about 10 minutes to drive from Bindella Winery to the outskirts of the beautiful stone wall surrounding the old section of Montepulciano. We wandered through the narrow streets, tempted by the many shops with cheese, wine, other food, and Italian leather purses and housewares. We stopped to have lunch at the famous Café Poliziano where I had a steaming bowl of the winter Italian soup made with kale, bread, and other vegetables. It was delectable with a warming glass of Vino Nobile. The view from the café is also stunning, with a panoramic scene of the surrounding countryside. Even though it was still foggy, the view was mesmerizing (see photo above). After lunch I hiked the rest of the way up the narrow roads to arrive at the main plaza. I took photos of the ancient well and church, and remembered when I visited in September two years ago and it was hot, sunny, and packed with tourists. Now I had the place to myself, and even though it was cold and foggy, it was still very beautiful. After lunch, we drove a short distance to Poliziano Winery, named after the famous Italian poet. Founded in 1961 by Dino Carletti, it is still managed today by his family, and we were charmed and honored to meet Federico Carletti, the owner, when we were tasting wine later in the afternoon. Margaurita, the Director of Hospitality, took us on an excellent tour of the vineyards, cellars, and then explained the export/marketing process during the wine-tasting portion of the tour. The estate is 120 hectares, making it the 2nd largest winery in Montepulciano. (All together there are around 70 wineries in the region.) The spacing in the newer sangiovese vineyards is 6 x 3 feet, but the older vineyards, such as the famous 50 year old “Asinone Vineyard” named for a donkey, is on wider spacing and filled with stones. They use sustainable winegrowing practices, but try to limit applications to organic substances such as sulfur and copper. They have 50 full-time employees but swell to 100 during harvest. Interestingly they mainly hire harvest employees from near-by farms, using local Italian workers rather than bringing in workers from other countries. Production averages 700,000 bottles per year. They have a state-of-the art gravity flow winery which was impressive to walk through, including truncated cone stainless steel fermenters (see photo). Margaurita said they prefer this shape of fermenter because it is easier to punch down the cap, and therefore is more gentle with sangiovese which needs to be treated more like pinot noir. The berries are sorted in two stages (by bunch first, then by berry). Next they ferment the Vino Nobile for 20 to 25 days at 30 to 32C using selected yeast. Both pump overs and punch downs are used. The wine is pressed and then moved to French oak for aging, with 1/3 going to cask, 1/3 to 500 liter, and 1/3 to 225 liter barrels with a blend of 50% new oak. The wine is racked every 6 months (3 times total), and is topped once a month. They have two cellars, one for the first year and the second for the second year aged wines – very much like Bordeaux practices. For the Rosso they are using some American oak. We tasted the 2010 Rosso which had a nose of black cherry and anise, but was rather thin on the palate. The 2009 Vino Nobile was classic with violets and earth on both nose and palate, but with a higher alcohol than I was expecting. My favorite was the 2009 Asinone Single Vineyard, which was 100% sangiovese in 50% new oak. It had an amazing nose of violets and spice, and on the palate had exquisite inky concentraction with a long finish. Yes! One aspect of Poliziano in which we were all very impressed was the fact that they are aggressively pursing the Direct to Consumer channel in Italy. With the expection of Castello di Verranzzanno, no other wineries we visited considered this to be a viable channel. However, under the guidance of Margaurita, they have completed a brand new visitor center which last year attracted more than 8,000 visitors with 5 – 7% in direct sales. As we were a California delegation and used to large direct to consumer channels with very healthy wine tourism campaigns in Napa and Sonoma, many were surprised that Tuscan wineries did not seem to be using this channel. However, Margaurita told us that thousands of tourists pass by their winery every year on the way to Montepulciano and Cortona, so they decided to expand into this channel. It only makes sense, and we were very impressed they are doing this. In fact, several people in our group said they would like to hire Margaurita to come to California because of her excellent knowledge of winemaking and enthusiastic and professional manner of communicating. In terms of exports, Poliziano sends 60% of their wine abroad to 45 different countries, with Germany being their number one market. In California, they use Dalla Terra, based in Napa, as their importer/distributor. Jan. 8, 2013 – Siena was shrouded in fog when we awoke, and though we were hopeful it would dissipate later in the day, it never did. Our first winery was Bindella, which is located in the hills outside the town of Montepulciano. The view of the surrounding countryside and the hilltop town in the distance would have been spectacular except for the very thick white fog that cloaked everything. Our hostess, Francesca, apologized profusely but no one can control the weather, and in some way, the drifting fog through the winter vineyards and tall green cedars made the whole scene even more hauntingly beautiful. Francesca led us to a colorino vineyard next to the cellars and it was interesting to see they used guyot with cane pruning for this variety, whereas they preferred cordon for sangiovese. They have 74 acres of vineyards, and use IPM farming (Integrated Pest Management) with 8 x 3 spacing. Like many other Italian wine estates, they have multiple crops, including 27 acres of olives, 86 acres of wheat and 50 acres of wood. Thomas, the Director of the Consorzio Vino Nobile di Montepulciano, was also on hand to welcome us and provided useful brochures describing the regulations of the region. Francesca cautioned us not to confuse the sangiovese grapes from this area, which are called Vino Noble di Montepulciano with the actual “montepulciano” grapes from the Abruzzo region, which have softer tannins and plush dark purple fruit. She admitted that she had to explain this difference constantly to visitors, and I wondered for about the tenth time why they insist on using the same name for both a town and grape when they are completely different. Part of the explanation is that the town of Montepulciano is quite ancient, and the term “Vino Nobile” means “noble wine from Montepulciano,” dating from 746 A.D. Obviously they do not want to give up this prestigious history, and so they must continue to explain constantly that they are different. I’ve finally just started calling the region “Vino Nobile” and leave off the “Montepulciano” so it doesn’t confuse my students. “Vino Nobile” produces sangiovese (usually the prugnolo clone with its violet scent), and d’Abruzzo produces the montepulciano grape. 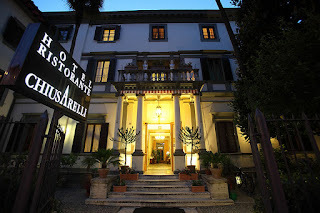 The grapes must come from the region and be processed into wine there in order to be called Vino Nobile. Regulations are more generous in that only 70% of the wine must be sangiovese, whereas the other 30% can be a variety of grapes including merlot, cabernet sauvignon, colorino, caniolo and others. This results in a wide variety of styles, and therefore sometimes makes it difficult to differentiate a Vino Nobile from Chianti in a blind tasting. I have a tendency to like the ones that blend colorino and merlot, resulting in a deep colored wine from the colorino, with the plush tannins of merlot, but the fresh acidity of the sangiovese. Regular Vino Nobile must be aged at least 2 years before release whereas riserva is 3 years. Giovanni, the winemaker at Bindella, explained the winemaking process for Vino Nobile. He said that the sangiovese grapes grown on clay soil created more powerful wines with stronger tannins so he aged those in smaller oak barrels, whereas the sangiovese from sandy soils with smoother tannins were destined for the 300 liter casks. He said they all age 20 to 22 months in oak and 6 months in bottle. Fermentation temperature for Vino Nobile is 25 to 28C, and they use commercial yeast. We also spent some time discussing the rare Vin Santo from this region, which is made from 100% sangiovese and called Occhio di Pernice. It is a unique red color the Italians call “Eye of the Partridge.” The grapes are hung in a dry location from September to February and then pressed. They age 7 years in small oak barrels with no racking or topping so the wine is oxidized and usually quite sweet with an alcohol level averaging 16%. Probably one of the most interesting aspects of this tasting is that Giovanni allowed us to taste tank samples of colorino and sangiovese. The colorino was a dense dark purple with huge grippy tannins and an inky berry taste. It is primarily used as a coloring agent in Vino Nobiles. We tasted the 2009 Bindella Rosso and Vino Nobile. Both were excellent and made in a more elegant style. The Rosso actually had 10% syrah, whereas the Vino Nobile was 85% sangiovese with the remaining 15% colorino, candiolo and mammolo, another Italian grape that adds a violet flower note to the wine. Bindella exports 65% of their wine, with Switzerland as the number one export country (the owners of the estate are Swiss). They have 14 employees, produce around 11,600 cases per year and have annual revenues of around 1 million euros. We found our visit here to be highly hospitable. Both Francesca and Giovanni were ultimate professionals, being very open, friendly, and willing to share information freely about the winery. (Jan. 7, 2013) - We didn't arrive in Siena until around 9pm that evening but it was impressive to drive into the night lit city and see the ancient walls and our hotel, an old Italian villa, with welcome lights shining through the marble pillars that fronted the lobby. Hotel Chiusarelli is housed in a beautiful old neoclassical villa built in the 1860’s. In addition to the lovely entrance with a charming garden, it is graced with high ceilings with frescos, lovely arched doorways, and has a nice breakfast room downstairs. The memory of the smell of home-made hot croissants served every morning still makes my mouth water. They had 3 different types, and it was impossible to resist the chocolate filled ones. On the downside, the hotel has no elevator, so we were not pleased that our room was on the top floor and we had to haul our luggage up multiple flights of marble steps. However, once we reached the room, it was cozy with two beds, a refrigerator, a nice bathroom and a great view out the shuttered windows. Some of our group even got rooms with balconies. After unpacking, we walked to the Palazzo de Campo, which took about 10 minutes from the hotel. Even though we didn’t get there until after 10pm on a Monday night, two of the restaurants/bars on the plaza were packed with locals. We decided to sit outside like everyone else, and settled into table under heaters with warm blankets. It was cozy to sit there, have a drink, and watch the world go by on the very famous Palazzo where the ancient Palio still runs every year. One very valid complaint that our tour participants had was that we didn’t spend enough time in Siena, and worse – they didn’t get to see the city during the day. This was because the winery tours took all day, and each time we returned to Siena the sun had already set. 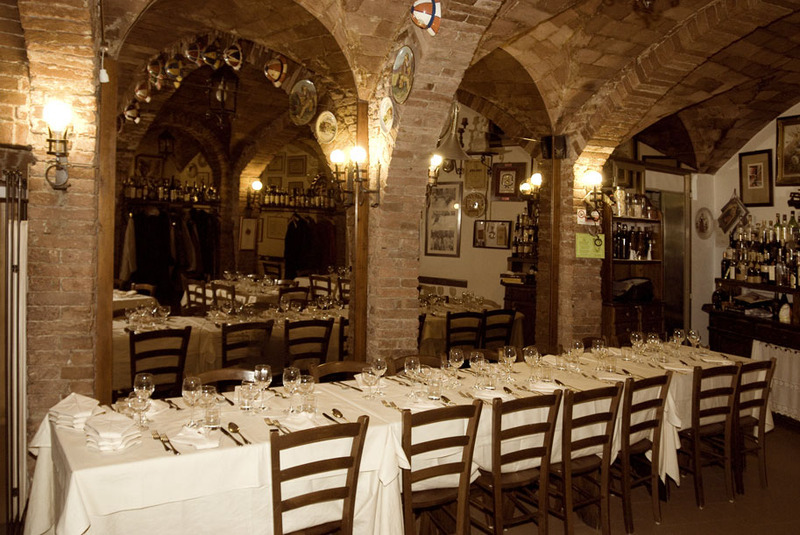 However, the second night, we asked the desk clerk at the hotel to recommend a restaurant and he raved about Bagoga – Grotta di Santa Catarina. Therefore, after getting lost several time and eventually having a nice local lady walk us to the restaurant, we settled into a table in a cozy dining room that was decorated with warm brick walls, arches, and painted plates. We decided to order a bottle of Morellino di Scansano, because this was the one DOCG in Tuscany we had not yet tried and weren’t planning on visiting. It was very good, with rich dried cherry fruit, spices, and plush tannins – more like a merlot, than a sangiovese. We started with a simple salad, but for the main course I splurged on a filet mignon in truffle sauce. The aroma of the truffles when it arrived at the table made me giddy with joy, and I was impressed with the small pieces of black truffle sprinkling the steak and sauce. However, I was even more impressed with the waiter came over and began to shave very thin slices of white truffle over the top of the steak. Yessssssss…doesn’t get much better than this. And the steak was only 20 euros! We ended with a double dessert of two different types of cake and two glasses of the local vin santo (see photo). It was a very nice meal!